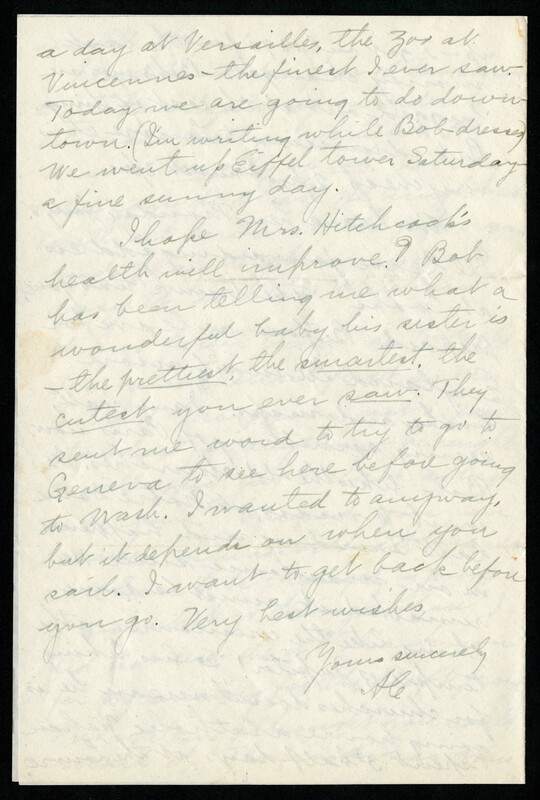 Letter - Mary Agnes Chase to Albert Spear Hitchcock, July 5, 1935, Record Unit 229: United States National Museum, Division of Grasses, records, 1884, 1888, 1899-1965, Smithsonian Institution Archives. 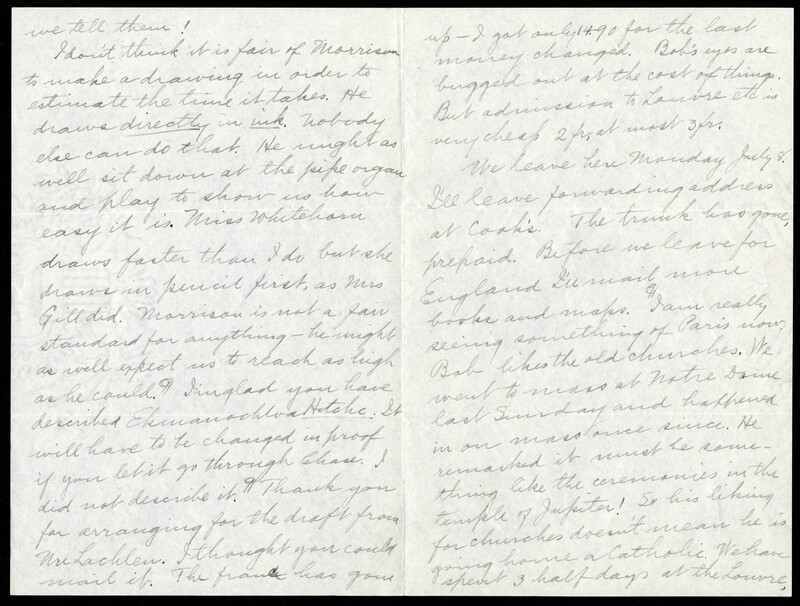 The first time I was introduced to Mary Agnes Chase was in her 1922 letters, and she was boarding a ship to Europe. This was post-World War I, and she was heading to Vienna, Austria to conduct work for the Unites States National Herbarium. My first impression was that she was rather blunt, and not afraid of speaking her mind. She is equally taken aback by the mostly German crew, the unabashed drinking on board the American ship, and the women smoking. Her blunt observations in her correspondence throughout the 1920s and 1930s show a woman who was disgusted with the way things were, and felt that some things needed to be changed. Born in Illinois in 1869, Mary Agnes Chase was raised in Chicago where in 1888 she married William Ingraham Chase. Sadly William died from tuberculosis within the first year of their marriage. Mary started working for the United States Department of Agriculture in 1903, and over the years worked her way up from botanist illustrator to senior botanist. For most of her career, Chase worked closely with Albert Spear Hitchcock building the collection of grasses for the United States National Museum (now National Museum of Natural History). This work often required her to travel abroad, and she spent a fair amount of time in Europe and Brazil. She had a keen eye that brought the countries she visited to light, both culturally and politically. Reading her letters is as much a history lesson as it is a botany lesson. She spent a great deal of time describing her daily routine, and not always in a flattering way. She was disappointed with the European train system, and her choice of words in 1922 is almost verbatim with what she says about it in 1935 in regards to how terrible she thought the porters were. Clearly the system had not improved enough to meet Mary's standards. She also had a bit of difficulty with relaxing and "letting her hair down." For example in 1935, she was upset that Easter was a week long holiday in France, and that she was not allowed to have a personal key to the museum. Her letters from Brazil are lighter, and while she still was rather annoyed when distracted from her work, it seems there is a marked difference. In one instance she complains about her ankle holding her up having sprained it in the field, but her complaints have a laughter about them as if she is chiding herself for getting into that situation more than being completely incensed about it. I got the impression that it was the people of Brazil that warmed her up. Mary seemed to bond with them far more that she did with the Europeans. Some part of it could be attributed to post war prejudices, but I also get the impression that her work in Brazil suited her more. In Brazil she was doing field work on American grasses, her specialty, and she seemed to thrive in this environment. From her letters you get a good sense of the woman who championed the causes of the working classes and suffragettes. But what struck me the most are the parts of Mary's life that we don't know about. Most of what we know conclusively about her started after Mary was well into middle age. Where is the young Mary Agnes Chase? Who was this woman other than a world class botanist? There are a few details in her letters about grandchildren, sisters, and family; however most of her private life is shrouded in mystery, and if you do research on her, you find few answers. How did Mary juggle her private and professional lives? Did she hand a child or children perhaps off to a sibling while she traipsed around the world in search of grasses the way so many male scientists did in her day? Did she promise to write to them when there was a spare moment? The biographies that mention her marriage never speak of children. However, in a letter from July 5, 1935, Mary gushes over the birth of a new granddaughter. She was in a hotel room with Bob, apparently her grandson, who was visiting her in Paris, and older brother of the new granddaughter. She goes on to say how her child begged her to come to Geneva to see her new grandbaby. 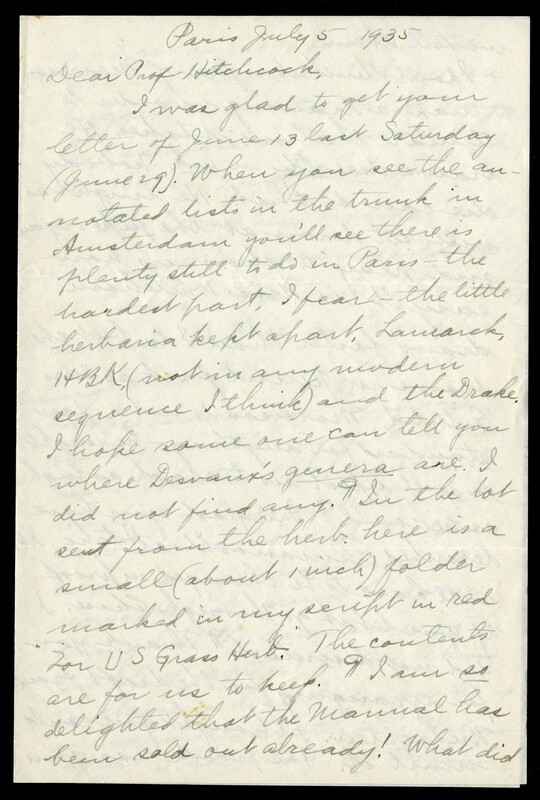 She goes on in an August letter to inform Hitchcock that she is extending her stay to go to Geneva to see the new baby. We now know that she has two grandchildren, but what about her children? Why is there so little discussion of them? Perhaps one day someone will discover a scrap of paper or a photograph of a young Mary Agnes Chase holding the hand of a small child. Her child. Until then we can only speculate.